Over the weekend, I taught a one-day class on revision. I’ve been offering the class for years, but a few things have happened recently that have made me rethink parts of the course. First, I had to revise my novel, The Hundred-Year Flood, for the last time before it was published, and I felt for the first time that I had a pretty good grasp of how, exactly, I was revising it–that is, what my revision process actually looked like. 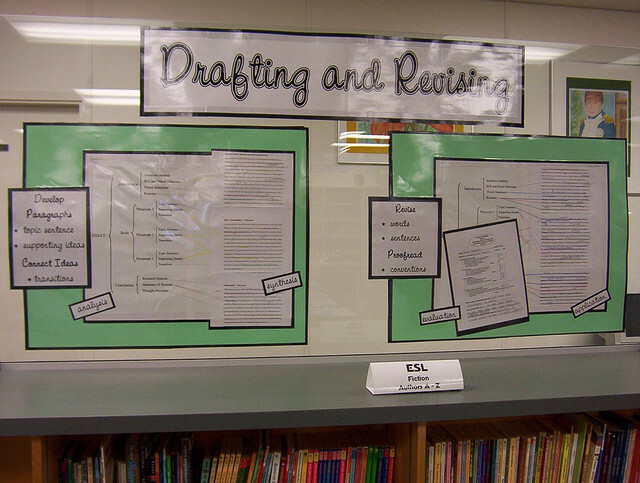 Second, I had a few conversations with some great writers about how they teach revisions–more on this to come. The workshop usually attempts to give students a good idea of what to revise or edit, and sometimes what to revise to or toward (suggestions for improvements, such as more character development or possible plot twists or a change in POV), but that’s not what students mean when they tell me they don’t know how to revise. They mean that they don’t know how to implement the changes that they want to make, how to take the draft they have and work through the in-between to something closer to the new draft they have in their heads. I split my revision course into two parts. I ask students to bring copies for the class of the first page of whatever they’re revising and one copy (for themselves) of the entire piece. We spend the first half of the class looking at macro issues and how to figure out what those issues are and what to do about them, and the second half looking at more specific troubleshooting (which might be the next natural step once you’ve identified problems). I’ll write about the first half this week and the second half next week. We started our course on Saturday by introducing ourselves, which we did by talking about the projects we were working on and what our revision process has looked like on those projects so far. Then we offered our “best revision tip(s)” to the class. I talked about expectations, etc. Then we dove in and I started with two things about revision: 1) learning that when you reread your work even for the 100th time and it is boring, it is boring for the reader on the first read; and 2) that revision is about re-vision, and that changing how you see the piece, literally and/or figuratively, whether by changing fonts or mediums or time or whatnot, can be extremely helpful as a first step. At this point I gave the students a first draft of a story, which we read and “workshopped” briefly to identify things we would change. This is when the process really starts coming into it. This weekend, I did four things with the story. First I talked about what questions we might ask the story, and where I would start if I were sitting down to revise it, what I usually look for first when I am going to revise something (what is it really about? where does it really start? why does it matter? and contributing questions like, how does the character change, why, what does he want, why can’t he get it? and so on). I walked them through how my own process would start, in other words, by questioning what I had in the draft and trying to figure out answers that would let me begin revising–an easy one is identifying the real beginning and starting to rearrange information and scenes from there. Second I demonstrated the use of sticky notes to track scenes visually, writing a note for each scene and lining them up according to how many pages they took up. This made clear the imbalance in the story and the real beginning (not on page 1 but halfway through). Sticky notes are everything. Third we tracked the things that the reader learns in the story (context and information) page by page. This meant pasting five pages to the wall and listing on each page the things we learn on the corresponding page of the story. From this exercise, we saw how the pacing and structure of the story made it seem to restart in the middle. And also how we weren’t learning enough, especially between the beginning and the middle, and at the end, which was already one of the things the class had mentioned while “workshopping” the story. Fourth we cut up the story wherever it changed time, and we pasted the story to the wall page by page so that each page was represented by a column, with the things that happened furthest in the past (on that page) lowest on the wall and the things that happened most recently (up to the point of telling) highest on the wall. This gave the class a visual idea of the chronology of the piece, the use of backstory, and the structure. There were far more little pieces to cut up at the beginning and one long scene that spanned the final three pages. The story in its cut-up state looked like a mess, and my class liked being able to see it this way and to get a sense of the story visually. After this, we read the final draft of the same story and talked about the improvements it made. We also talked about further improvements we might make if it were our story, to emphasize that revision is never finished. I talked hypothetically about how I might have gone about making some of those changes, such as by identifying the absence of one character from the piece and wondering what her role might be, why she was absent in the first draft, and what potential she could play out, and then by writing about the relationship in a way that connects to the main theme and situation. (Sorry for the vagueness.) Then we repeated the steps of the first draft with variations. Instead of tracking the scenes in terms of their pacing and how many pages they took up, we used sticky notes this time to “sweep” the story for what each “scene” or passage was about and what its purpose was in the story. I pointed out how doing this for the first draft revealed that several scenes were doing the same work. This time the purposes were clearer and more “necessary” to the piece, and the themes were more related. We wrote down a list of things we learned on each page, again, and compared it to the first draft. This time the information is better paced, the context is clearer, and crucial information comes in and affects the arc of the story as it goes forward. This is all visually represented, so that if you looked at the list from afar, it looked more like a narrowing triangle and less like (as in the first draft) two mountains. We cut up the story and pasted it to the wall in the same way. The shape here, too, is much like a narrowing triangle instead of the mess it was the first time. I demonstrated how moving the piece around in the first draft might help the author come to the shape of the final draft. I also talked about how I look for where to cut up a story and what information might fit in between, and why I put backstory in certain places (where will it put the most pressure on the present story? and other questions). Seeing the story in first draft and final draft gave the class a sense of the bookends, and most of what we talked about was what happens in the middle, between those draft. How do you re-envision the story either by cutting it up or by sticky notes or lists or questions or so on? How do you start working on the things you want to do by moving the pieces around or filling in what is missing on the sticky notes or answering questions for yourself? How do you split up the tasks? How do you look at a piece as a whole and yet search out where smaller additions and cuts can be made? Etc. If we had more time, or in a multi-week course, students would try these strategies out on their own stories and maybe present this for class discussion. Alas. From here, we needed to talk about what you do when you sit down with a slightly better understanding of your story and what needs to be done with it.